Paraquat is the second most popular herbicide in the world, but it is highly toxic and studies have found that ingesting just 3 grams of it can cause failure of the liver, kidney and other organs, fibrosis of the lungs and respiratory failure. There is no known antidote. Due to the relatively high risk of accidental ingestion, aqueous solutions (AS) of paraquat have been banned in over twenty countries worldwide, including Australia, Germany, the UK and Malaysia, and now China is following suit. Producing paraquat AS for the domestic market was made illegal on July 1, 2014, and on July 1, 2016 the sale or use of paraquat AS will also be outlawed. China’s Ministry of Agriculture also re-classified paraquat as a highly poisonous substance on July 28 this year. Paraquat is a huge industry in China, so the fallout from the ban will be significant. According to CCM’s research, China produces 150,000 tonnes of paraquat per year, and it is also the main downstream market for related products such as pyridine, over 200,000 tonnes of which is produced in China each year. Though only 20,600 tonnes of this paraquat was consumed in China, with the other 130,000 tonnes being exported, the ban will still leave a significant gap in the market. “We estimate that sales of paraquat products in China will halve following the ban on paraquat AS,” said Li Zhonghua, Secretary General of the China Crop Protection Industry Association (CCPIA). This would reduce consumption by over 10,000 tonnes, handing manufacturers of substitute herbicides a big opportunity. The close similarities between diquat and paraquat make diquat an excellent like-for-like substitute for paraquat. The substances are both dihydropyridines herbicides and non-selective contact herbicides, and are both main competitors to glyphosate in the non-selective herbicide market. Diquat is also more effective as a weedkiller than other substitutes such as glyphosate and glufosinate-ammonium, an though it is not quite as effective as paraquat, it has the advantage of being less toxic. “Due to Chinese manufacturers’ limited production technology, the price of glufosinate-ammonium is unlikely to reduce significantly even as production capacity expands,” commented Chen. Though diquat TK (technical concentrate) is twice as expensive as glyphosate, glyphosate resistance is becoming an increasingly serious problem around the world and many farmers are turning to diquat since it has no equivalent resistance issues. The attention Chinese manufacturers are paying to diquat testify to its strengths as a substitute for paraquat. Several major manufacturers have promoted new diquat formulations this year, including Nanjing Redsun Co., Ltd., Zhejiang Yongnong Chem. Ind. 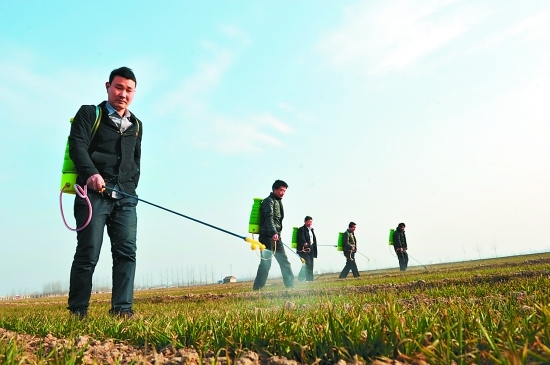 Co., Ltd. and Shandong Luba Chemical Co., Ltd. Of these, Nanjing Redsun’s launch of Fanchu - a 20% diquat cation AS sterilant herbicide - is particularly noteworthy since it appears to be specifically aimed at capturing the paraquat market. Not only is diquat similar chemically to paraquat, even its registered formulations closely match its rival. Approximately 90% of paraquat’s formulation registrations in China are AS, while for diquat the figure is 100%, according to China’s Interstate Compact on Adoption and Medical Assistance (ICAMA). Although diquat has a lower toxicity than paraquat, toxicity is still one of the similarities between the two products and could be a problem for diquat going forward. Indeed, the toxicity of diquat is highly contentious, especially following the Ministry of Agriculture’s decision to list paraquat, but not diquat, as a highly poisonous herbicide. Despite the similarities between the two substances, diquat was labelled ‘low-toxicity’ and ‘medium-toxicity’. According to reports from agrichem.cn, experts inside the Shandong Provincial Department of Agriculture also considered including diquat in the Catalog of High-Risk Pesticides when they were compiling the Catalog in late August. “There is still a risk that the toxicity level of diquat may be revised upwards in future,” Chen added. Need more information about China’s herbicides market? CCM Agrochemicals gives you access to the most comprehensive intelligence on China’s pesticides market available anywhere at an extremely competitive price.